The April issue of Club CR8 is now live! Continue reading below to see how you can purchase your copy. I've also got ONE copy to giveaway! 1 book + 7 instructors + ∞ ideas = Club Cr8! For just $8, less than the cost of 2 cups of coffee, and less than a $1 per project, we will walk you through 8 different Embossing Techniques that will stretch your supplies and your imagination! Wet and dry embossing tips and tricks. Wet embossing with stamps and stencils and much, much more! 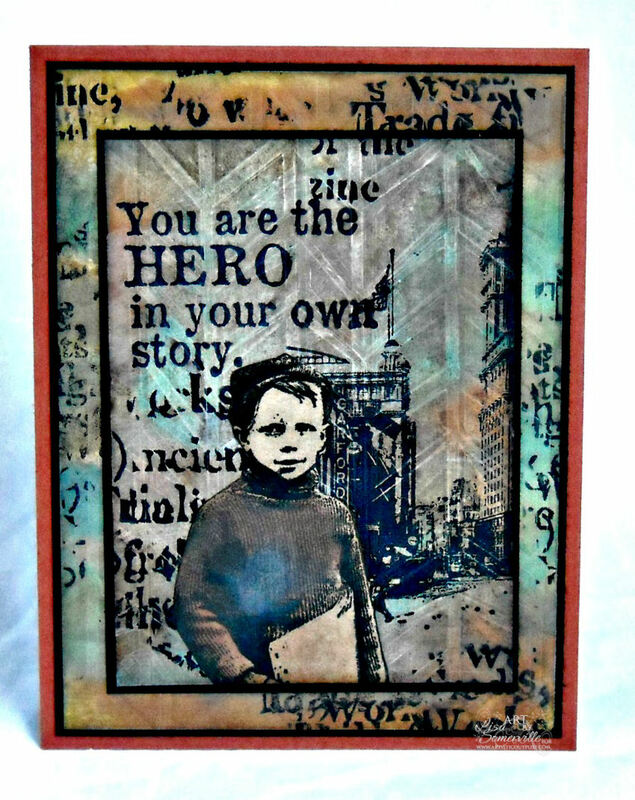 This is one of the cards I created using the Dry Embossing with Stencils Technique in the April issue of Club CR8. 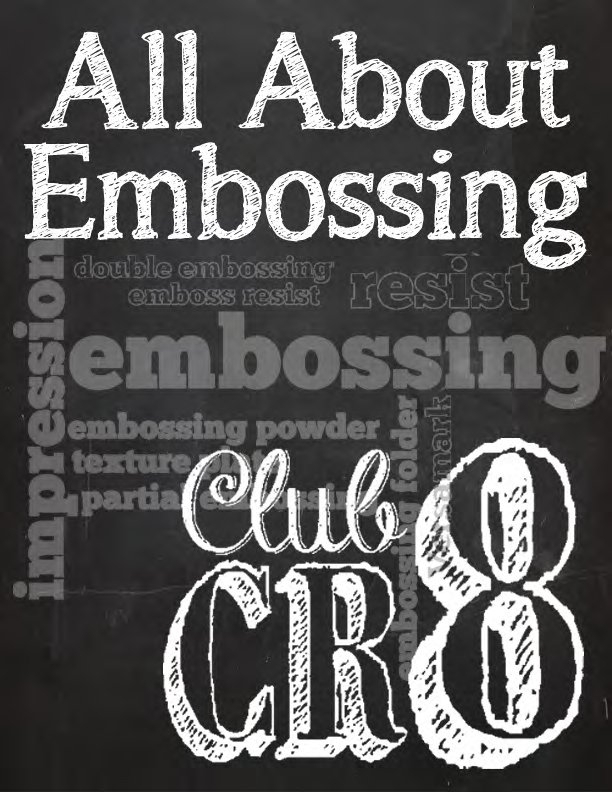 Want to win a copy of the April Issue of Club CR8 - All about Embossing? Simply leave a comment on this post by Saturday, April 20th 11PM DST. I'll use the Random Number Generator to pick the winner and will post the winners name on Sunday, April 21st here on my blog. Be sure to check back to see if you won! Wow! I would love to win this Copy!! Thanks so much! "Happy Spring"
What a great book to have!! Hope I win it!! :) Thank you for the giveaway!! what fun to visit your blog to see your cards and for a chance to win Club CR8-All about embossing. Luv that boy...and your bg! Sounds like a fun win. I'd like to win a copy. I like your little newsboy card. This would be great to win. Thanks for the chance. always want to learn new tchniques. Thanks for the offer. Love embossing and am always interested in learning new techniques! Thanks for the chance to win the new issue of Club CR8. Thank you so much! This is so timely. Just what I needed to get inspired. What a great give-away! Would love to win! Embossing is a favorite of mine, but haven't done anything with it lately, maybe this book will spur me on! 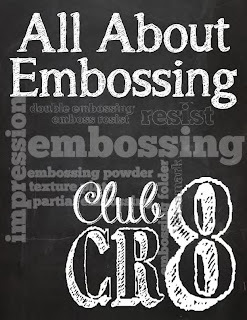 What a wonderful chance to win the CR8 embossing book, I luv embossing! The ideas are endless! Thanks! Your card is very nice and it would be interesting to see how you made it. I like all kinds of embossing so it would be nice to be a winner of your giveaway. What a fantastic book! Looks like you have some fantastic techniques in this book and I always love new or old techniques. Would love the opportunity to win one of your books and blog all about the projects I learn from it. thanks for the opportunity. Loved card sample. I'd love a chance to win the Embossing book. I love to emboss with my brass stencils. Always looking for new ways to use them. I love your card! and I would love to win the book! Learning is something that never stops and I can see that I still have a long road ahead of me. Thanks for the inspiration and the chance for winning. 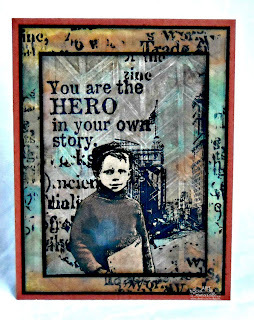 Love these Gelli print pieces - thanks for sharing your work! This ebook sounds great. Thanks for the chance to win. I don't do much embossing, so I would love to be inspired. Great card!! Would love to win this embossing book! this book would be such great inspiration! Thanks for the chance to win!You ladies are awesome! This would be nice for back up of diff embossing techs! Hope you pick my number. Great card! It would be nice to have this book handy! I am very sure I would use it a lot. Wow!Thanks for the chance to win a copy of this book!